There are large areas of silences in the Indian Constitution and filling in those silences involves drawing principles from the Constitution itself, observed Justice D.Y.Chandrachud, while presiding over the Distinguished Public Lecture, delivered by the visiting Australian jurist, Michael Kirby AC CMG, Former Judge, High Court of Australia. 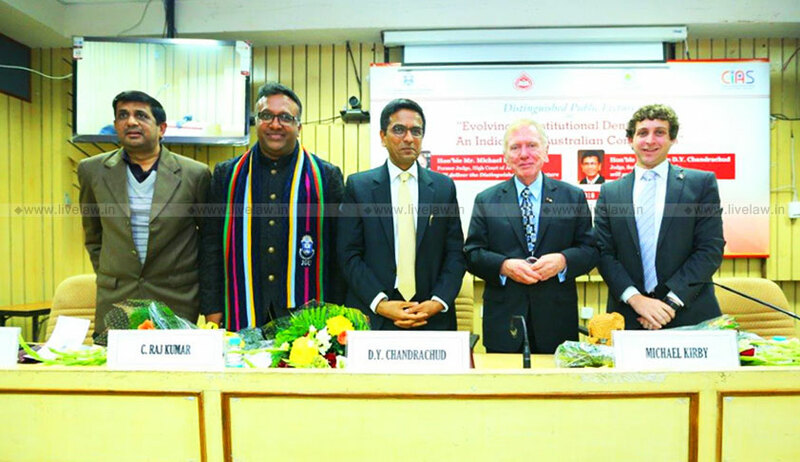 The lecture on the “Evolving Constitutional Democracies: An Indian and Australian Comparison”, held at the Indian Law Institute, New Delhi, this evening, was organised by the O.P.Jindal Global University. Kirby, who has been a long-time admirer of Indian judiciary, is credited with frequent citations of Indian judgments, during his tenure as a judge. According to a calculation, his citations of Indian judgments alone constitute 68 per cent of the total citations of Indian judgments by the Judges of the High Court of Australia, which is the apex court in that country. Comparing Australian and Indian Constitutions, Kirby said constitutional democracy, Parliamentary system, federal system of governance and rule of law are certain common features to both the countries. Among the similarities, he referred to Section 92 of Australian Constitution and Article 301 of the Indian Constitution, both of which, he said strengthen the nation by strengthening the market. Among the differences between the two countries, Kirby said Australia did not have a long freedom struggle like India, and that unlike India, she still follows constitutional monarchy. Australian Constitution, unlike India, has no provisions to deal with Emergency powers, and it is extremely hard to change the Constitution in Australia, as it requires two-thirds majority in the Parliament, he said. Paying glowing tributes to Justice P.N.Bhagwati, and Justice Y.V.Chandrachud, with whom he had personally interacted, Kirby said the issues facing India and Australia are similar, and both can learn much from each other. The problem of indigenous people in Australia is similar to the caste oppression in India, he said. Referring to the LGBT and queer community, Kirby said, persons belonging to this minority, deserve dignity and respect. Equal treatment of LGBT persons is a challenge both in Australia and India, he said, while complimenting the Delhi High Court’s judgment in the Naz Foundation case, and the recent Supreme Court’s nine-judge bench judgment in the privacy case, which underlined the need to reconsider the Apex Court’s judgment in the Koushal case. Kirby, however, refrained from dwelling more on the subject in the presence of Justice Chandrachud, respecting his need to observe neutrality and objectivity, as the Constitution bench is yet to reconsider the Koushal verdict, which reversed the landmark verdict of the Delhi high court in the Naz Foundation case. “There are gay people in all walks of life”, he observed. Justice Chandrachud, in his address, recalled the role of John Lang, the Australian lawyer and novelist, who lived most part of his adult life in India, and was the counsel for Rani of Jhansi. Recalling his engagement with the Australian Constitution, while deciding the interstate commerce case as part of the nine-judge Constitution bench last year, Justice Chandrachud said his dissent in that judgment underlined that freedom of movement of human beings is important to unified common market. There is common ethos, of connect with the British empire, as both the countries rely on common law and the judgments of Privy Council, he pointed out. Dwelling on his 18 years as a judge, Justice Chandrachud admitted that judging makes one aloof from society, and look inwards, and a judge faces the great danger of losing contact with the reality outside. Judges across the common law, share the same concerns about globalisation, and denial of rights, he added. Saying that constitutions lay down broad framework of governance, Justice Chandrachud dwelt at length on the subject of Constitutional silences. While they open the doors to read rights in an expansive way, there are also door-closing silences in the Constitution, with restraints on exercise of power, he explained. Judicial discretion involves entrenching beyond what is reserved for judiciary, he said. Both in the privacy and ordinance cases decided last year, he said the Court drew principles from the Constitution itself. Asking what is constitutional morality, he said it means going beyond the public opinion of the day, and the shifting opinions of the times. It could mean counter-majoritarianism, he suggested. He referred to one of Kirby’s judgments in which he interpreted domestic law in the context of Australia’s international obligations. Justice Chandrachud also emphasised the value of dissent, describing it as a powerful tool to aid the evolution of law. “Yesterday’s dissent is today’s majority”, he said, while recalling how the dissents of Justices Fazal Ali, Subba Rao, and H.R.Khanna, later became the majority opinions, changing the face of the Indian polity. Reflecting on the contemporary times, he said as a society, there is a bias against dissent, and pressure to go with the majority view. “This tradition must change over a period of time in favour of dissent”, he said, while pointing out that the youth in India today increasingly question the prevailing views on many issues. The function was attended among others by Soli J. Sorabjee, and senior advocates, Indira Jaising and Anand Grover. Sorabjee was the first Indian to have been appointed an honorary Member (AM) in the General Division of the Order of Australia, for service to Australia-India bilateral legal relation. The second Indian to get the distinction is Sachin Tendulkar.